“That our business has throughout half a century steadily increased from a small beginning to its present dimensions, is sufficient evidence of the quality of our work. No pains will be spared to maintain and increase the reputation of the “SETH THOMAS CLOCKS,” and we give our warrant to the full amount of the cost, that every clock that leaves our factory, if properly used, will prove a good Time Keeper. Excerpt from an 1863 catalog. Seth Thomas is perhaps the most recognized American clock manufacturer of all time. Almost everyone over the age of 40 has heard that name associated with clocks of some sort. Seth Thomas may not have been the most important man when it comes to clock innovations and design but Seth Thomas was one of, what we might consider, the founding fathers of the clock manufacturing boom that occurred in the United States in the early 1800’s. Where other American clock companies came and went in a relatively short time period the Seth Thomas Clock Company has existed in one form or another up until modern times. Beginning about 1800 and up until about the 1920’s clock manufacturing in the United States was very big business. Imported clocks from Germany, England and France were typically too expensive for the average American home. Because of this there was an excellent opportunity for American ingenuity to produce an affordable clock and many companies were formed based around this very idea. From the beginning of this clock manufacturing boom there were a large number of companies producing these inexpensive yet very functional and durable clocks. Many of these companies were destined to have very short lives where others like Seth Thomas, Welch, Ingraham, Waterbury, New Haven and Ansonia (among others) would last for many decades. Of all of these various companies the name Seth Thomas endured longer than almost all of them. Of course, as time progressed the Seth Thomas Company ceased to be owned by members of the original family. 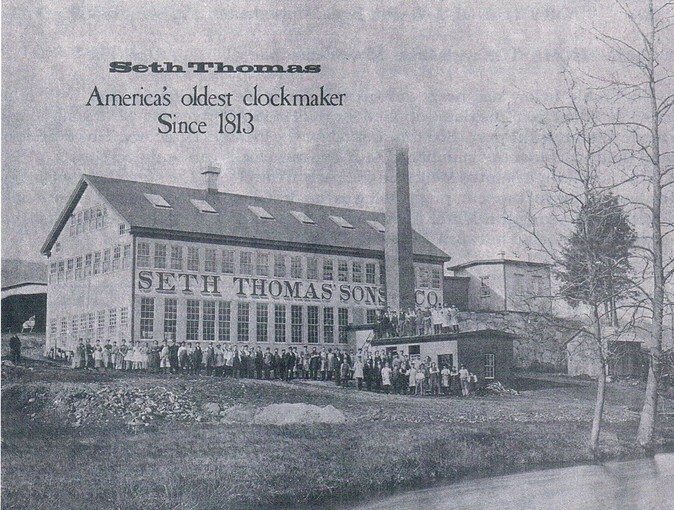 Companies using the Seth Thomas name continued to manufacture clocks up until very recent times, as late as the 1980’s. Seth Thomas was born in 1785 in Connecticut, an important hub for American clock innovation. At the young age of 14 he began his clockmaker apprenticeship under a man named Daniel Tuttle. Seven years later Seth Thomas went to work for the now renowned Eli Terry. Eli Terry had been given a contract to produce 4,000 wooden tall case movements over a three year period. This type of production was unheard of at the time as previous to this clock movements were individually handmade. This also meant that parts following the same pattern were often not interchangeable. In need of help, Eli Terry hired the 21 year old Seth Thomas fresh out of training, along with Silas Hoadley. After the contract was completed in 1810, Eli Terry sold his shop to Thomas and Hoadley for $6,000, enabling him to experiment with manufacturing shelf clocks. Thomas and Hoadley continued to produce tall case clocks and began to paint their names on the clock dials branding them “Thomas & Hoadley”. On December 4, 1813 Thomas sold his half of the business for $2,000, five days later he bought land from a former apprentice of Eli Terry. The land Seth Thomas had purchased included a clock factory, conveniently located near Eli Terry’s new shop. 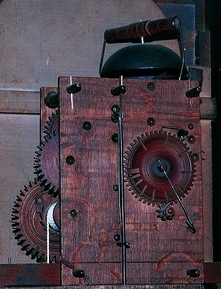 Thomas produced more tall case clock movements until 1818 when he was approached by Terry. The two men came to an agreement that Thomas could manufacture and sell Terry’s new shelf clock for a 50 cent royalty per clock. Thomas continued to produce various types of wooden movements and clock styles until 1840, when the brass movement was being introduced. (Wooden tall case clock movement shown on left) Being a businessman and not an innovator, Thomas acquired this new technology from Chauncey Jerome who had brought the brass movement to the market. Seth Thomas placed his first brass movements into the market in 1842 which inevitably stopped production of wooden movements by about 1844. By 1850 Seth Thomas was producing 24,000 brass movements per year! At this time he employed about 50 men and was using water wheels and steam engines for power. Spring driven 30 hour and 8 day movements were introduced around 1860. During this same time frame, time only weight driven “Regulator” models were introduced. 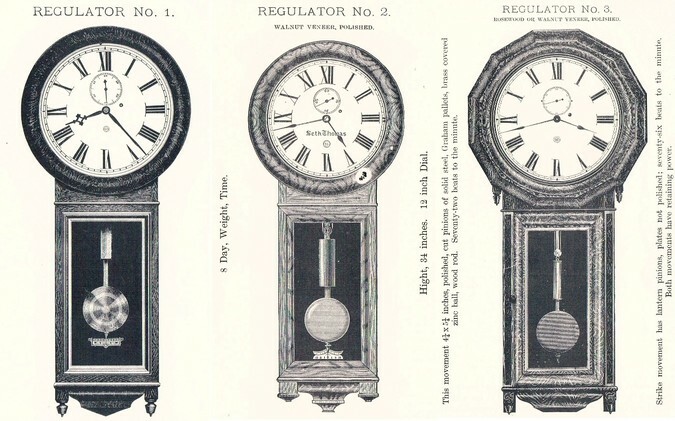 The Seth Thomas clock company had three Regulator models called the Regulator #1, 2 and 3. The most famous Regulator #2 model was manufactured with little change from 1860-1950. It is probably the longest produced clock model in history and is still considered highly collectible. By 1860 the company was producing 40,000 clocks annually. Seth Thomas had such an impact on his town of Plymouth Hollow that sixteen years after his death they incorporated as a separate town called Thomaston. In 1865 Seth Thomas’s Sons & Company was formed as a joint stock corporation, to manufacture high grade pendulum movements and French imitation movements. 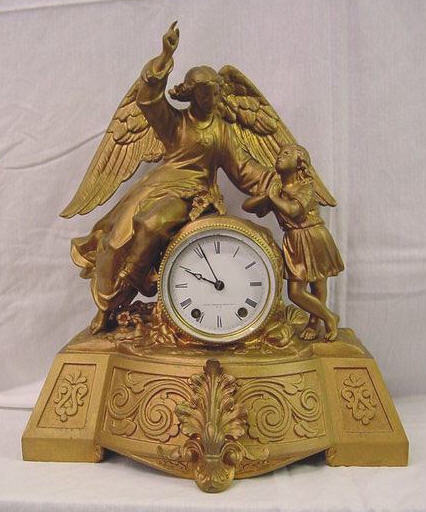 (angel figural clock made by Seth Thomas’s Sons & Company shown below) By the year 1870, 133,000 clocks were being produced annually at the Thomaston factory. By 1872, Seth Thomas’ Sons & Company employed 225 men and 340 women and had a trade catalogue with more than 100 different clock models. Seth Thomas’ Sons & Company was absorbed by the Seth Thomas Company in 1879. Between 1883 and 1915 the Seth Thomas Clock Company began producing pocket watch movements. They produced 18 models, each in four grades. 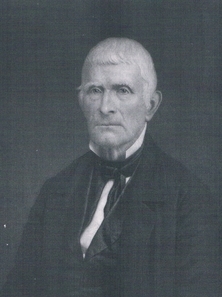 When Aaron Thomas retired in 1892 he was replaced by his nephew, William Thomas Woodruff who was then succeeded by Seth E. Thomas Jr. in 1919. In 1931 the Seth Thomas Clock Company became a division of General Time Instruments Corporation. By 1960 the company was only a shell of its former self, no longer making their own movements and most of their case work was being contracted out to other companies. In 1982 the company was moved from Thomaston, Connecticut to Norcross, Georgia. In 2001 the Seth Thomas Clock Company filed for bankruptcy and the Seth Thomas trademark was purchased by the Colibri Group of Providence, Rhode Island. 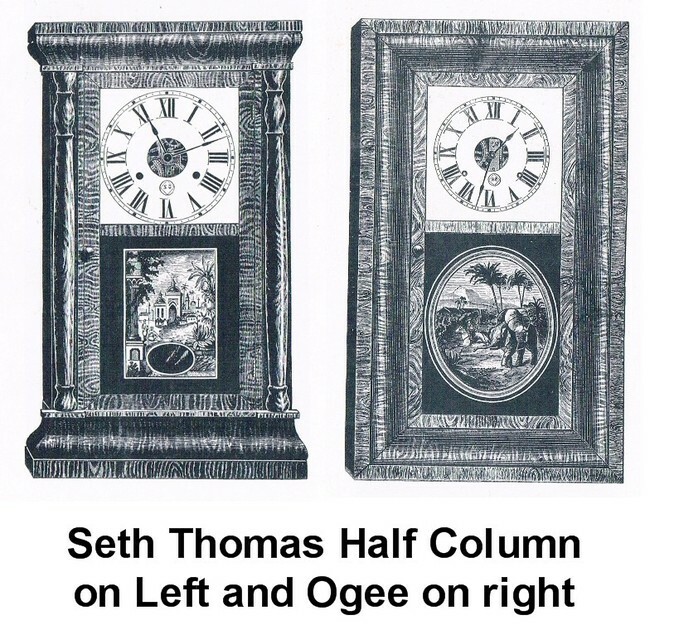 Some early Seth Thomas Clocks can be dated by the address of the printer (Elihu Geer) that printed the clock information labels found inside many of their clocks. If your label is still intact the printer’s name and address can be found in small print at the bottom of the label. 1839-1844 26 ½ State St.
After 1865 18 State St. Catalog Reprint by the American Clock and Watch Museum, Inc.
Do you have a Seth Thomas clock you would like to have restored? Feel free to contact Michael using the Contact Us page. 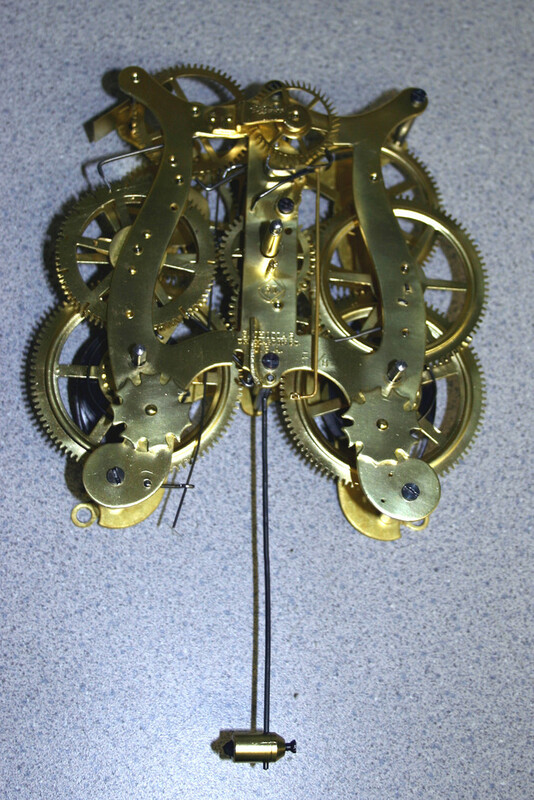 Restored Seth Thomas Clock Movement by Michael Gainey of Master Clock Repair shown below.